STOCKHOLM — What reflects the sunlight more sharply in this handsome city: the painted facades of centuries-old buildings, the waters wrapping around the 14 islands that comprise Stockholm, or the blonde hair of most residents? Or maybe the light is just a facet of the feel-good nature of Stockholm. Its waterfront streets are lined with photogenic architecture. Its retail boulevards have all the upscale brands – and electric trolleys reminiscent of days gone by. 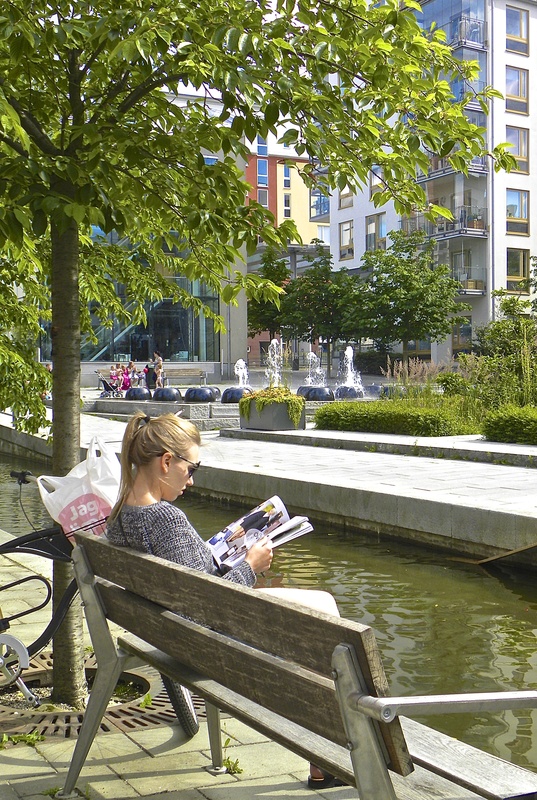 All departments of its city administration are working on a plan titled Stockholm 2030. Culture? Among its dozens of major museums are showcases ranging from the Nobel Prizes to the original-art campaign for Absolut vodka, from two spectacular royal palaces (Sweden is a monarchy) to modern photography, from the history of money forms (bones, stones, metal and paper) to an outdoor collection of 150 buildings from all over the Sweden, portraying the nation around the turn of the 20th century. 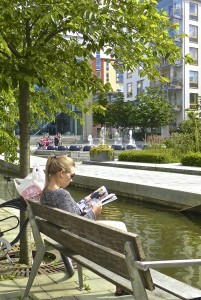 Relaxing by a canal in a newer residential section. New in 2013 is a museum of Swedish music beginning with the 1920s and including a quartet that hasn’t performed together for 30 years: You may remember ABBA. All things green? Stockholm’s Ekoparken (literally, eco park) is 10 square miles – about eight times as large as New York’s Central Park. Ekoparken sprawls across land and water within the main city and two suburbs. It includes part of the popular tourist island that houses a roller-coaster-centric amusement park, and the wildly popular museum housing the raised and re-assembled Vasa, a huge warship that sank in the harbor in 1628. To cut the emissions from cars, a public-private organization provides about 1,000 bikes to rent from more than 80 sites – pick one up here, drop it there. But there’s barely room to navigate even a bike in Gamla Stan, literally, the Old Town. 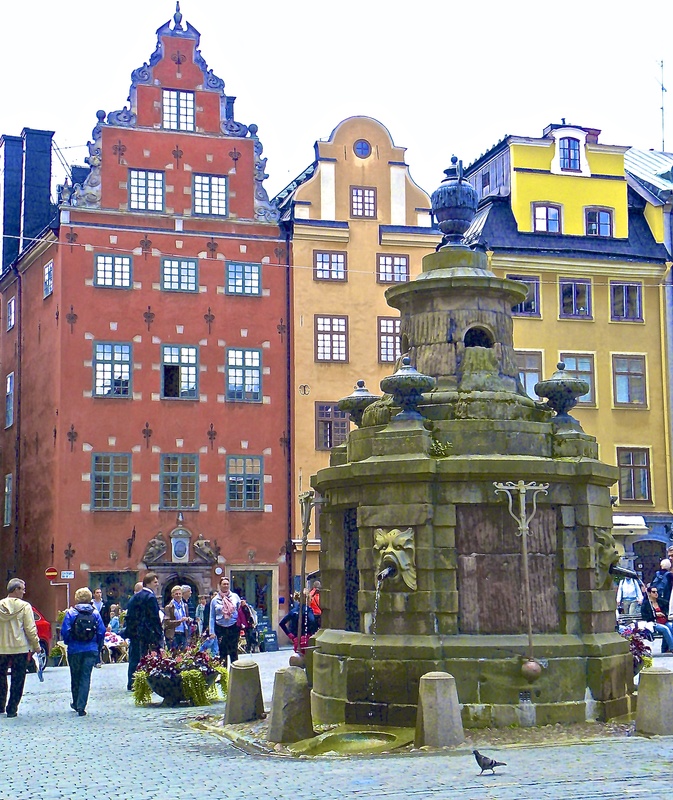 Occupying an island just a five-minute walk from the bustling downtown commercial district, Gamla Stan is one of Europe’s best-preserved, and largest, neighborhood of medieval structures, dating to the 1300s. Painted in brilliant shades as well as pastels, these four- and five-story buildings close in on alleyways barely an armspan wide. The occasional plaster face of a saint or ancient Swedish hero adorns some corners above the first-story level. Here and there, wrought-iron finery or even reproductions of ancient guild-members’ signs project over the heads of pedestrians. And passersby there are, as Gamla Stan seems in danger of becoming a victim of its popularity. Brilliantly painted buildings line this charming old square that also boasts the innovative Nobel Museum. T-shirt stores, tiny cafes and pastry shops, and boutiques offering a relentless parade of moose – the popular national animal – on shirts, sweaters, wood carvings, metallic doo-dads, stuffed versions for the young-at-heart, etc. Consequently, the streets are thronged on warm summer days, the residents of Gamla Stan steadfastly negotiating the crowds as they push their bicycles to their butcher or green grocer, mostly just around the corner from those main shopping drags. Imitating the locals is a good method for you to best enjoy the island: Simply turn on to one of two dozen or so streets and alleys that ultimately reach the crest of Gamla Stan’s hill, site of the 600-room Royal Palace. You might even find that you have these tiny byways to yourself. That is, unless residents are headed to the eye doctor, architect, the rare maps and books shop, or an old, old restaurant with its metal guild sign over the front door: a giant pretzel. This particular out-of-the-way place — I stumbled on it at the intersection of Kindstugatan and Sjalagardsgat – is about four blocks from the Palace and the adjacent Storkrykan, the cathedral dating to 1279. Both are also tourist magnets. The Palace, built in the 18th century in the Italian Baroque style, contains several museums. But you don’t need to go inside to enjoy the big draw: the daily changing of the guard at the king’s official residence. 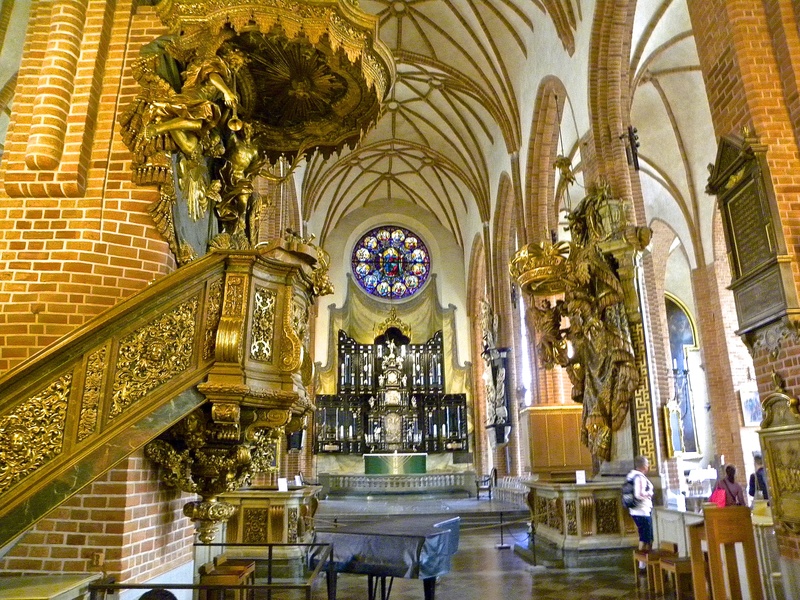 Parts of the foundations of the Stockholm Cathedral date to the mid-13th Century; the altar seen in the background here is made of ebony wood and silver. Close to the Palace is the cathedral, site of the marriage in 2010 of the crown prince and his bride. It holds two artworks particularly revered. One is an elaborate statue of St. George slaying the dragon (created three years before Columbus reached the New World). 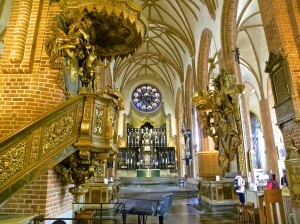 The other treasure is the main altar, with its silver inlays on a large ebony wood structure. To put the crowds behind you, step aboard one of traditional tour boats for a relaxing ride out into the archipelago of 30,000 islands. The boats are designed to offer maximum viewing of the glorious scenery as you motor past undeveloped islets, lightly populated islands, sailboats gliding and power boats occasionally pulling a water skier. These mini-cruises are a Stockholm tradition, with roundtrips lasting from two to more than eight hours. You can book a meal onboard, bring your own picnic or grab a meal in one of the island villages that cater to handfuls of residents as well as daytrippers. These boats, some more than 70 years old, also head to Drottningholm Palace, about an hour – and 350 years – from Stockholm. A UNESCO World Heritage Site, the Palace was built in the mid-1600s and is sometimes referred to as the Versailles of the North. The Palace, also an official residence, is resplendent inside and boasts acclaimed gardens and a Chinese Pavilion whose original structure was given as a birthday gift by the king to his queen in 1753. The cruise back into Stockholm’s downtown harbor provides a reality check following the natural panorama of the archipelago. You are motoring into the heart of the largest city in Scandinavia, bustling with traffic on land and water. From your boat, the cityscape is defined by church spires, a hilltop palace, even an amusement park. It’s all illuminated just right. Before going to Stockholm, I had figured I needed three days to “see’’ it. I was off by half. Getting there: Several airlines offer one-stop, overnight flights between major U.S. airports and Stockholm’s excellent Arlanda airport. From there, you can catch an airport bus or express train right downtown. Staying there: For location, you can’t do better than the Sheraton Stockholm. It’s two blocks from City Hall, from a bus stop serving popular routes, and from the central train station. The hotel is about eight blocks to the main retail street and modern shopping centers, and about that close to Gamla Stan. Getting around: You can move through Stockholm, a city of about 860,000, on foot, tram, bus, ferry boat or a “hop on/hop off’’ boat popular with tourists. There are also guided Segway and bike tours. Getting started: Without a doubt, your best buy is the Stockholm Card, which can be purchased online before you leave or at the visitors bureaus (www.visitstockholm.com). It provides free admission to more than 80 museums and attractions, free rides on public transport and free or discounted sightseeing tours. The Card prices fluctuate, but recently the price for adults was 495 Swedish krona for one day, up to 1,050 for five days. Current exchange rates of about 15 cents to one krona mean these cards are about $75 and $159. The visitors bureaus have an array of maps, brochures and advisors to help, and they maintain about 300 “boards’’ set up in major tourist areas that let you connect with a live advisor. Go to the web site visitstockholm.com as a starting point. Another free site for timely information is the Stockholm is the Stockholm Cruise Blog (www.avidcruiser.com/stockholm). Created by American Ralph Grizzle, who spends part of each year in Sweden, part in North Carolina, and the rest aboard cruise ships, this blog offers residents’ own lists of must-sees and must-eats. Take a taxi or be a local and step aboard the Nos. 2, 3 or 76 bus to the island of Sodermalm. Once the bus is on Sodermalm, get off after it turns on to Renstiermas Gata (cq), at about the location of the Norska Kyrkan (a church), on your right. Drivers speak enough English that they can understand your request to be notified at this point. Continue briefly on that street and look left for a broad footpath uphill; cross the street and this path will take you past several small cottages, painted maroon. These formerly were the homes of shipyard workers; they have been refurbished and converted into low-cost housing. Continue on this footpath until you reach a T intersection. Turn to your left and within a few yards you’ll reach the terrace on Fjalgatan. Your elevated view is simply wonderful, looking across one of the main bodies of water and down toward several of the islands. Below to your right is Djurgarden, the island containing the museums for the warship Vasa, the Absolut art collection, a more-traditional art museum, an aquarium, the amusement park and Skansen, the outdoor collection of 150 authentic 19th and early-20th century structures. There are also gardens and paths to cycle or stroll. To your left is Gamla Stan, beyond it is Noormalam and slightly farther left, the 350-foot-high tower of City Hall. Later, you’ll want to join one of the English-language tours of City Hall. In one of its two immense halls, they squeeze more than 1,300 in for the Nobel Prize banquet (the awards are handed out elsewhere in the city). In the city council’s chambers, officials perform dozens of minute-long (cq) wedding ceremonies. The walls of the other ornate hall are covered by millions (cq) of gold-colored mosaic stones creating huge images of religious and mythical figures. 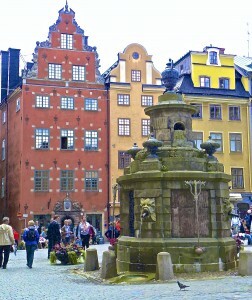 In addition to the sites mentioned here, I enjoyed the museums for the Vasa, the Nobel awards (have the guide turn upside down one of the chairs in the small café – they have been signed by recent laureates), the Mint Museum (its name translates as Coin Cabinet), even the Stortorget, the plaza and fountain directly in front of the Nobel museum). And yes, you can book the Girl With the Dragon Tattoo walking tour. Shopping and dining ideas: Most every upscale brand has its own store or is within the huge NK and Ahlens complexes on Hamngatan (it changes names to Klarabergsg in the center of town. The pedestrian zone of Drottninggatan has specialty boutiques, the department store PUB (cq) and the flagship of the fashion store H&M. One of Stockholm’s venerable restaurants is the clubby Prinsen, with an eclectic selection of art on its walls. My dinner there was delicious, if pricey, and I would have enjoyed it more if I had not been surrounded by American tourists conversing between the tables — but not about the city in which they were dining. Robert N. Jenkins is former travel editor of the St. Petersburg, Fla., Times. His new e-book is End Bag, available for $2.99 at Amazon, Smashwords, Sony and other sites.